Food reminds me of people. 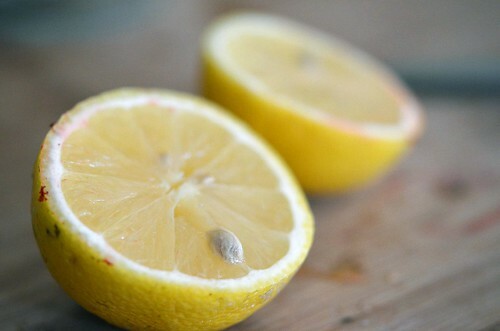 Lemon – grandma. Black Cherry Ice Cream and peach pie (not together…or maybe together) – mom. Chocolate – my sister-in-law (and her children). Lemonade and Reese’s PB eggs- my younger brother. Chocolate ice cream with ‘stuff’ mixed in (nuts preferably) my dad. Strawberry rhubarb treats and cherry cordial ice cream- my older brother. If you are in my life in some sort of fashion and you either mention a food you love or I notice (and I will) you eating something on a regular basis…it will be ingrained in my brain for eternity. A stupid human trick talent -or it is just my elephant like brain. Did you know that elephants never forget? A pachyderm I may be…I do walk loudly in my bare feet and enjoy carrots…but i hate circus peanuts. It is a toss-up. back to food…away from elephants. Why couldn’t I act more like a graceful animal…antelope or cheetah too much to ask for? OK, enough about the animal that best describes me. I am not gonna get a date saying I am more elephant than leopard. Yikes. I am not sure why I think of my older bro when I see a stalk of rhubarb. He does love the stuff and has helped me in ‘borrowing’ it from the neighbor’s back yard. We both grew up with it stuffed in pies and eating it raw, just dipped in sugar. Who knows, but this time of year…I see the pink celery like stalks and think – what can I make for Jeff?!? This go around…how about a cocktail. Or a mocktail. Whatever your preference. I am not sure if my brother likes gin…tequila, yes. Gin – I dunno. I guess my elephant brain is faulty or I have never discussed gin with Jeff. Not a gin lover? Use vodka. Not a lover of spirits…Use a clear pop (Sprite, 7up, Squirt…). 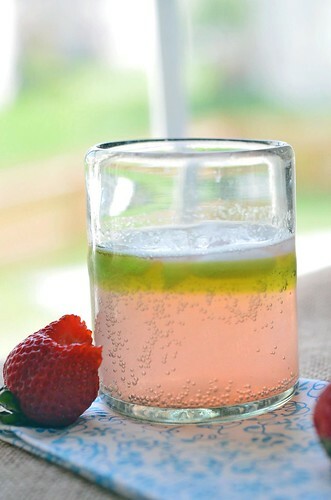 The outcome is light, refreshing, and tastes like spring. Oh and I named this drink a fizz without really knowing what a fizz is, but since it fizzes when mixed together…I figured I couldn’t be far off. A mixologist I am not. An elephant maybe…they do have long eye lashes, I dig those. 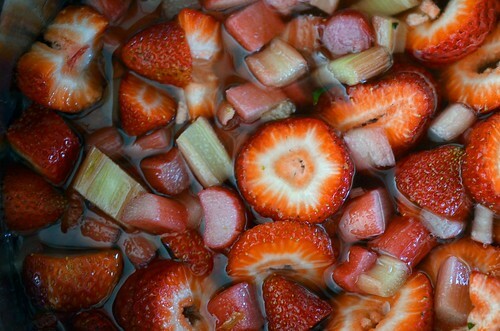 In a large pan, combine rhubarb, strawberry, sugar, water, and the juice of 1 lemon. Place pan over medium high heat and bring mixture to a boil and stir until all the sugar is dissolved. Reduce temperature to maintain a simmer and simmer for 20-30 minutes until the fruit has softened (the strawberries will start to lose their color). At this point, take a potato masher or a wooden spoon and smash the fruit to extract all the flavor. Remove from heat and let cool slightly. Place a metal mesh strainer over a large bowl and pour fruit syrup into the strainer. Strain. Cool completely before using. Store in the refrigerator covered for up to one week or can be frozen in small batches. But if you are like me…it is straight to the cocktail! 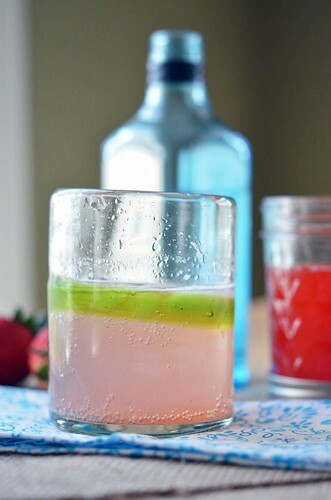 Pour 2 tablespoons of strawberry rhubarb syrup into a cocktail glass, followed by an ounce of gin, and top off with club soda. Add ice and stir to combine. 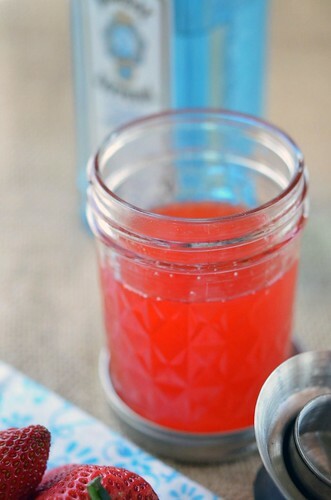 Other uses for syrup would include freezing in ice trays – strawberry rhubarb ice cubes, perfect for summer time lemonade. Return syrup to stovetop and bring back to a boil until it thickens. Cool and spoon over ice cream. And the number of drinks you can make with it are endless. I hope you enjoy !